I'm taking a few days off from work to use up my vacation time - and I am so glad to be doing so! I need a break.. The other night I was at the computer when the phone rang. I picked it up, said hello, and immediately someone starts blabbering in Chinese until finally I can get a word in edgewise. Then he starts blabbering non-stop again so I just hung up the phone. A few minutes later it rang again. Again I picked it up and again the same person starts blabbering but this time I stop him and ask who he is trying to call. "Who?" He gives me some name I never heard of so I told him he had the wrong number. Julie asked me who called and I told her some Chinese fool that wouldn't stop babbling on the phone so I hung up on him the first time and told him he had the wrong number the second time. On Wednesday, Julie sent me an e-mail at work telling me the good news that one of the paintings she had given to her art teacher for submission in an exhibit in Japan won a big award. When I got home that day there was a message on the answering machine. I listened to it and it was all in Chinese. Julie said it was the message her teacher left, informing her about the award. "Good thing he got a hold of me," she said. "He told me he tried calling before but kept getting the wrong number. Some man answered the phone and so he thought maybe he had my old phone number." I pressed the history key on our caller ID box until I got to the person who called the other night when I was on the computer. "Is this your teacher here?" "Oh, I hung up on him." Well at least the story had a happy ending. Julie got her award. 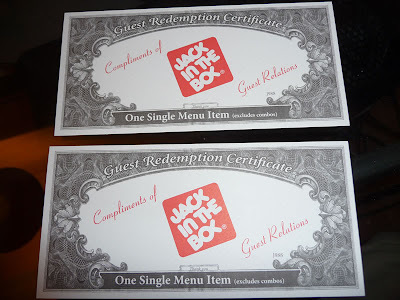 On to other things - I got my JITB coupons in the mail! Jack made good on his word (or rather the word of one of his guest relations people). Now I am wondering if I should take a chance on another hearty breakfast bowl. If I go back to the same place about which I made my complaint, they might be suspicious of me. Anyway, the vacation continues! Yay! Hey, I'm only trying to get my part of the economic stimulus! Haha.. they sent me TWO coupons just to shut me up.. or were you referring to Julie's teacher that I hung up on.. or both? Probably both. I like to annoy people. They ask me why am I so argumentative and I just tell them I am not argumentative.